On episode 18 of the podcast This Week in Parasitism, Vincent and Dickson discuss the intracellular parasite Cryptosporidium, which causes diarrheal disease in most mammalian species. 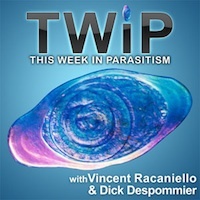 TWiP is brought to you by the American Society for Microbiology at Microbeworld.org. I haven’t finished your book yet, Dickson, because I’ve been extraordinarily busy. However, what I have been able to read so far is wonderful, and the cover art of the book is beautiful! !